Both Wireless or Bluetooth speaker allows you to enjoy your favorite music anywhere without the hassle of annoying tangled cables. 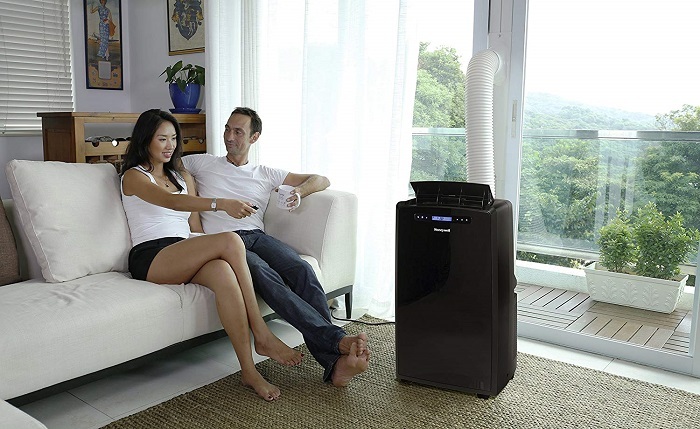 They also offer super easy installation process, energy efficient, impressive sound quality in budget-friendly prices. 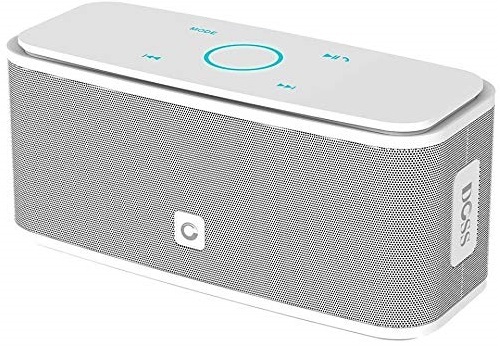 So if you like to enjoy the benefits mentioned above, and looking for the best wireless or bluetooth speaker, the list below will simplify your search. 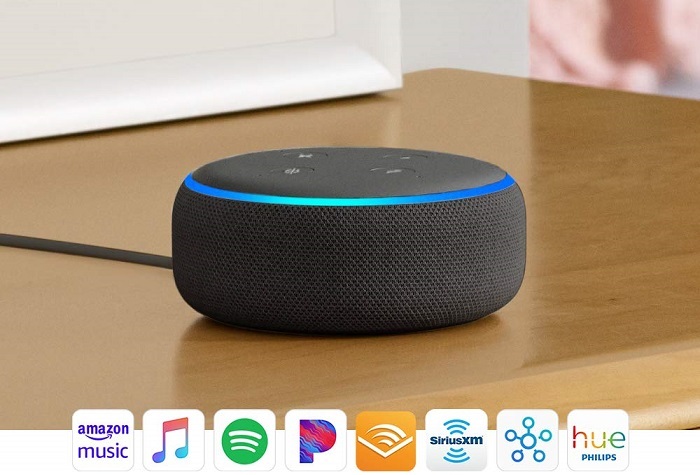 Echo Dot allows you to ask for your favorite song, or request a specific genre or mood with your voice. It also allows you to answer or make a phone call hands-free (no tapping or searching required) or controlling your other smart home devices. • Access to thousands of Alexa “Skills”. • Voice commands now sync across devices. • Connects to Bluetooth and wired speakers. • Works with a broad range of smart-home products and services. • Alexa app can be buggy. • Voice recognition hasn't improved. • Anemic sound from the built-in speaker. • Microphones don't cope well in environments with loud ambient noise. 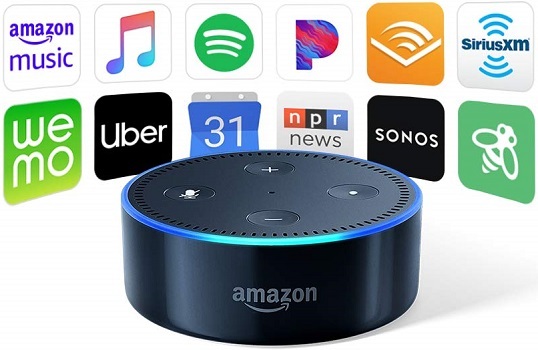 • Echo Dot is a voice-controlled speaker that uses Alexa to play music, control smart home devices, and make calls, answer questions, set timers and alarms, and more. • Play music from Amazon Music, Apple Music (coming soon), Spotify, Pandora, SiriusXM, TuneIn, and iHeartRadio. • Dimensions: 1.3” x 3.3” x 3.3”; 5.7 oz. 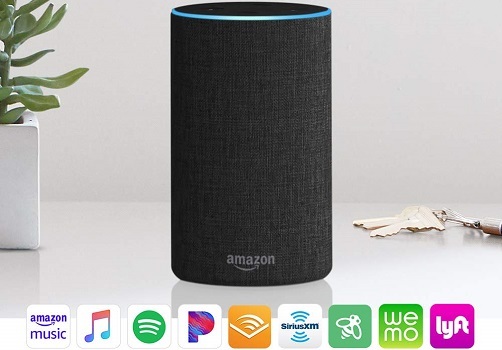 Echo (2nd Generation) allows you to play music, ask a question, make calls, send or receive messages, provide information, news, sports score, weather, or control your smart devices. • Far-field mic array works wonders. • No line-in and multiple orientations. 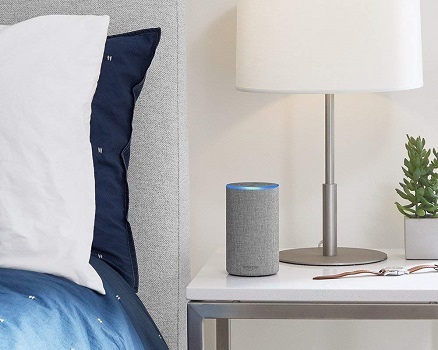 • Echo connects to Alexa to play music, read the news, set alarms and timers, answer questions, control compatible smart home devices, and more. • Stream songs from Amazon Music, Apple Music (coming soon), Spotify, Pandora, SiriusXM, and others. 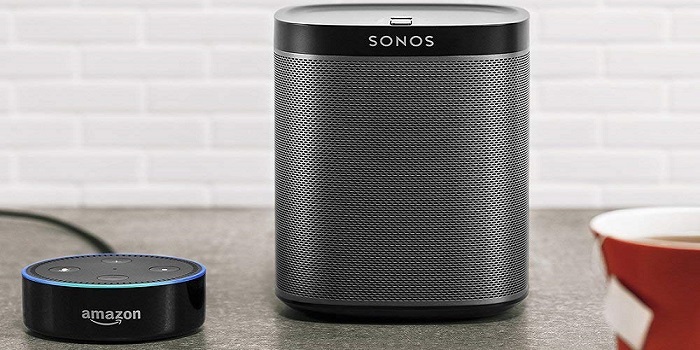 With compatible Echo devices in different rooms, you can fill your whole home with music. • Powerful speakers with Dolby technology play 360° audio with clear vocals and dynamic bass response. You can also use your voice to adjust equalizer settings or pair with another Echo (2nd Gen) for stereo sound. • Call and message almost anyone hands-free. Instantly drop in on other rooms in your home or make an announcement to every room with a compatible Echo device. • With seven microphones, beamforming technology, and noise cancellation, Echo hears you from any direction—even while music is playing. • Use your voice to turn on lights, adjust thermostats, lock doors, find TV shows, and do more with compatible connected devices. • Alexa is always getting smarter and adding new skills like tracking fitness, playing games, and more. OontZ Angle 3 delivers greater clarity stereo sound with clear mids and highs from dual precision acoustic stereo drivers. With its bass capabilities and the ease with which it can be transported from location to location, this speaker is ideal for backpackers and perpetual travelers who are tired of having to listen to their music through the piercing treble of the average set of earphones. • Sound never becomes distorted. 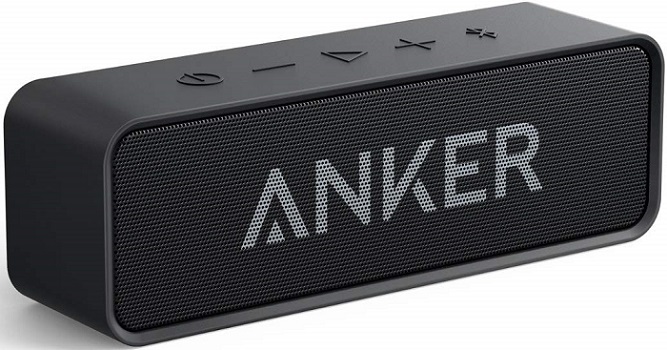 Anker SoundCore provides breathtaking stereo sound with deep bass delivered with exceptional clarity and zero distortion by two high-sensitivity drivers and a patented bass port. 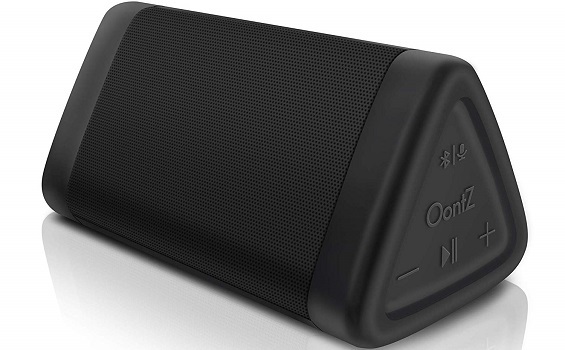 It boasts an impressive 24-hour battery life to play your favorite song all day long. • Top notch sound performance. • High quality music streaming. DOSS SoundBox allows you to enjoy a high definition stereo sound with an impressive volume whether you're lounging around the house or partying, walking out, camping, hiking, and biking. It' s portability, long-lasting battery, and metallic design makes it the perfect audio companion for both indoor and outdoor. • The touch control is very smooth and intuitive to touch. • A bit distorted sound at full volume. 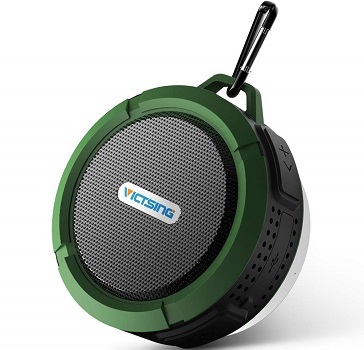 VicTsing comes with a 5W speaker to give you a better quality stereo experience. It also supports any Bluetooth-enabled devices such as iPhone, iPad, HTC and so on), PDA, tablet PC, iPad, Mac Air, MP3 players, PCs, laptops, etc. • Suction cup isn’t very good. • Takes some time to turn on. • No lanyard included to use the carabiner. • Irritating voice navigation whose volume can`t be lowered. • Support A2DP and built with a 5W speaker. It can streams incredible stereo sound with full range output, crystal clear sound. 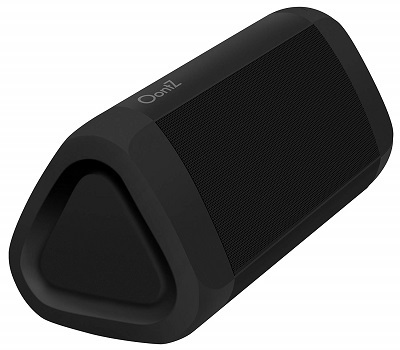 OontZ Angle 3 PLUS delivers excellent stereo sound and enhanced bass from its proprietary passive bass radiator design. • Crystal clear distortion-free sound. • No dual pairing mode. • No included wall adapter. AOMAIS Sport II provides less than 1% total harmonic distortion ensures enhanced clarity and fidelity. 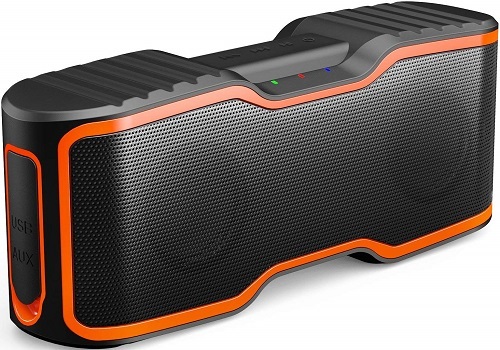 With 20W of power and high-quality stereo sound, you get deep bass, crisp audio, and distinct sounds and instruments. • Has call answering system. • Very fast battery recharging. • Very loud and good quality sound. • The sound performance is very consistent and clear. • No recharging adapter included. • The buttons are hard to see and stiff to press. • The top buttons present on the speakers are hard to work with. 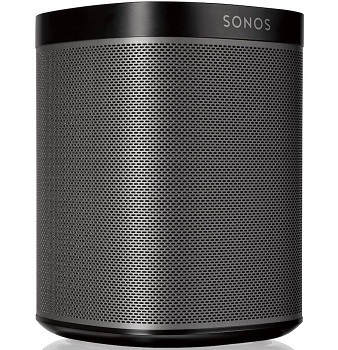 Sonos Original Play: 1 is humidity resistant allows you to enjoy your favorite songs in music-starved places like the bathroom and outdoor patios. The sound produced by the speaker is room-filling and it’s quite possible to use it as the main source of music. • Works with Streaming Services. Ultimate Ears BOOM 2 LE blasts loud insanely great sound with deep, powerful bass in every direction. It comes with exclusive tap controls that let you play, pause and skip tracks with a tap or two. • Doesn't "crackle" on high volume. • Incredibly crisp highs, detailed midrange and deep low end bass.